Grandma Martha Earnhardt called in to chat with Tanner in the Morning about "Dale," which premieres Tuesday on CMT (8-10PM, ET). "To me ... the whole movie ... it was like Dale was telling his own story." "The little deal with Dale Jr. interviewing his dad after a race ... when he was maybe 10, 12 years old ... that part I had never seen before." "I don't ever want to see the black #3 on the racetrack again." "I told [Junior] one time that I will find him a good country girl ... he said, 'She's got to be purty,' and I said, 'Well, you know I wouldn't find you no ugly girl ... I don't know ... he hasn't met the right one yet, I don't think." "The problem with Robby is, he is talking when he should be listening." 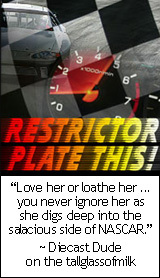 "Even better than safer barriers would be to take J.J. Yeley's license to drive in NASCAR and burn it. "Had Dale Sr. not died, Brad would have." During Sunday's race when Kasey Kahne was running poorly, Steve Hmiel mentioned that he wasn't sure if he bought into the "girlfriend" theory--the theory being that Kasey runs well when he doesn't have a girlfriend, but not when he does. Hmiel said something to the effect of, now "they" say they broke up and he runs well ... Either she's back, or it's not true. Q. So, are they or aren't they broken up? A. Well ... I didn't think it would be polite to ask them directly, so I don't have a definitive answer ... but, as mentioned in the Bristol FAQs, that's what "they" tell me. Observations: I saw plenty of Kasey and Ashley all weekend, only together a couple of times and I did not observe any interaction between the two that indicated they are still a couple. Not saying that means anything ... just saying. Q. 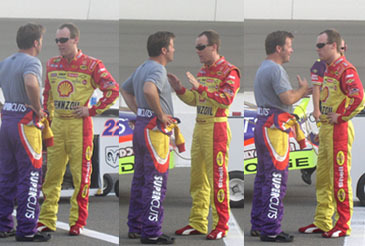 Is the brunette you spotted with Denny on Friday the same one who was pictured with him in his Busch Pole Award picture? A. Yes, that is the same girl I Twittered you about on the back of the golf cart. She was also with Denny in Michigan a couple of weeks ago. A. She is Amanda Gilliland, 22, Riverside County native and 2007 graduate of USC. 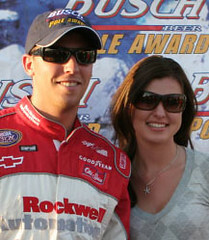 She is the younger sister of David Gilliland, Denny's competitor in the NASCAR Nextel Cup and Busch Series. Q. Is she the new girlfriend? A. Hmmm. How are we defining girlfriend again? Can we say dating? Observations: I was not witness to any PDAs between this new couple, either. I believe Amanda was meeting J.D. Gibbs for the first time when I saw them chatting. Despite her proximity to their pit just before the race started, I didn't notice any interaction between Amanda and any of her brother's crew. Q. Where does this leave Denny and Paris? Denny: "She definitely may be interested in going to a race, so I'm playing that out. I wouldn't go as far as to say we're going out on a date, but she likes to race the sports Mazdas, so we had a little bit in common." Q. Did Kyle and Erica break up? A. A question I wish had been asked before the weekend ... That was a new one for the inbox this morning, but already one source has confirmed rumblings of trouble in paradise. Erica was not at the track this weekend. Q. Is Tony Stewart playing the field? A. Uh ... can you say "track and field?" If the amount of questions that I get saying "I saw Tony Stewart at [insert track name or other location here] with a [insert female description here] on such and such day" is any indication, Smoke is enjoying his bachelorhood to the fullest. Don't you hate it when just one ruins it for everyone? Which NASCAR driver was recently forced to block his private jet's tail number from public flight tracking services due to the stalkerish activities of his fans an ex-"girlfriend" and her meddling mother? Note to readers: Feel free to leave your guesses in the comments, but the tallglassofmilk won't confirm, so don't bother inquiring about this... Keep the comments short and sweet. Unwarranted personal attacks on the subjects of this site and your fellow readers will not be tolerated. Q. What is a *blind item*?